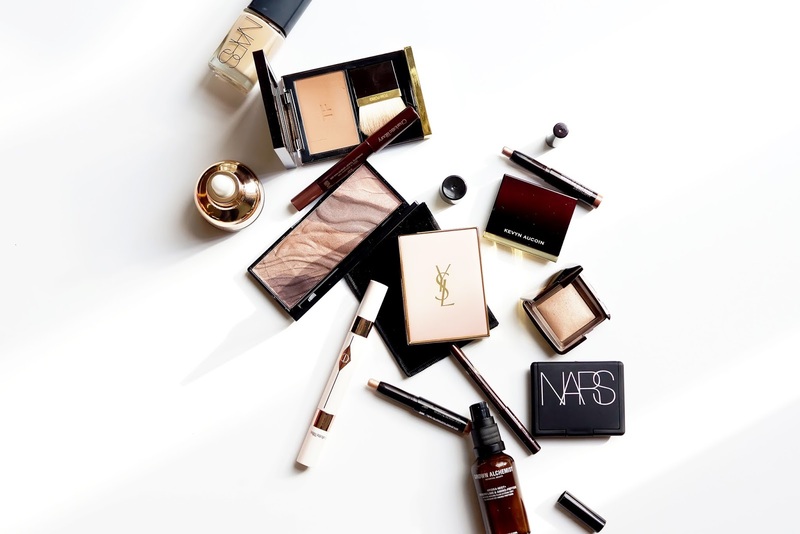 These are some of my very favourite beauty blogger posts to read, and as my last one was a pretty long time ago, I thought today I'd do an updated edition - although, insider update, I shot these photos just before my birthday, so the YSL Couture Contour (full review here) and Tom Ford Shimmer Shot (full review here) have definitely since made the cut - let's just pretend they're gracing the edit with their presence.. 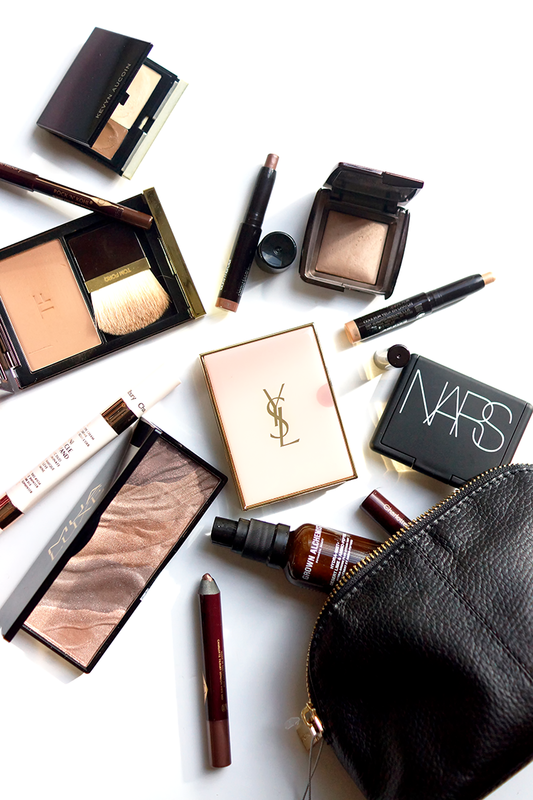 Anyway, let's get cracking with what's in my autumnal makeup bag! 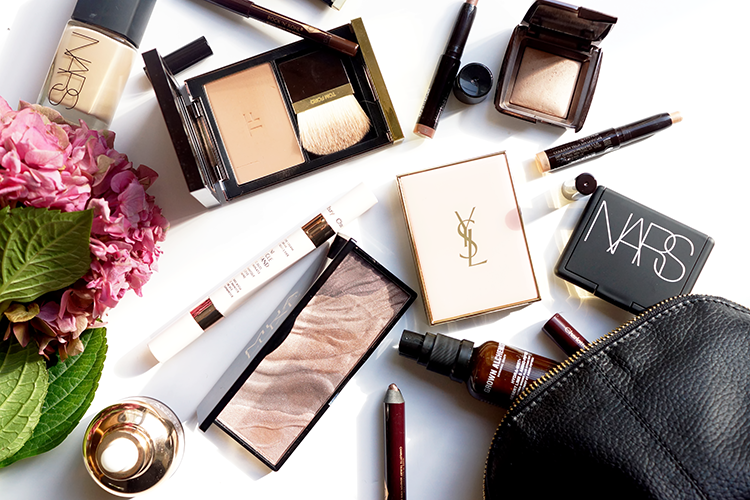 YSL Blur Perfector £32.50 (here for US) | Whilst I use this before makeup as a bit of a blurring primer, it's actually working quite well as a 'blotter' throughout the day. Much like the CoverFX Custom Blot Drops, you can take a little bit of the balm and apply on top of makeup, over shiny, oily areas, to mattify them without adding extra powder. I like to use my ring finger and tap as gently as possible, rather than smearing it around, so as not to disturb the makeup underneath. And other than it being a product I really like, who could resist it's beautiful packaging anyway? Charlotte Tilbury Miracle Eye Wand in Shade 2 £29 (here for US) | I've been known to top up under the eyes with this double ended wand throughout the day - actually patting a little of the eye cream on top of concealer part way through the day gives things a little refresh and resmoothes makeup that might have creased under my eyes in that time. I love it as it's so light in texture and leaves my skin looking bright and radiant. Laura Mercier Caviar Eyesticks £23 (here for US) | These dinky little minis of the Caviar Eyesticks are perfect for popping into your makeup bag - not that you should need on the go touchups with these, as the formula is so budgeproof. 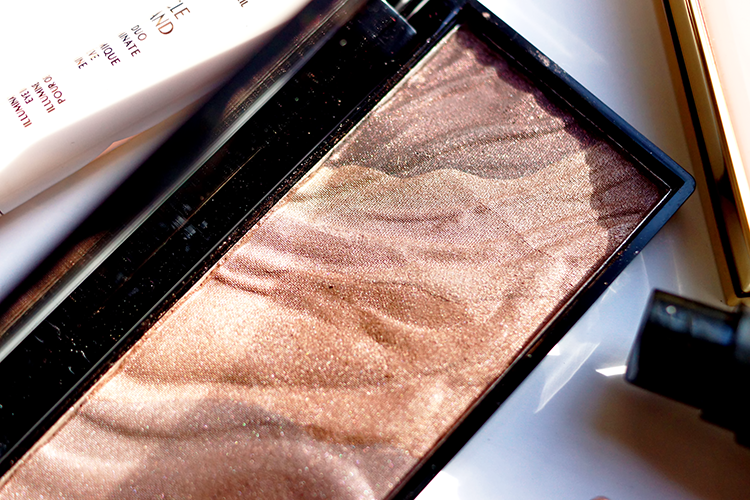 Rosegold and Amythest are stunning shades, the latter a favourite for an all-over-the-eyelid smudge - just add mascara. You can get them in this gift set of minis (and here for US). Nars Sheer Glow £31 (here for US) | So I've gone back to this foundation - the quiet favourite of old that's sat in the background whilst I experiment with every cushion I can get my hands on. Funnily enough, I've been applying it with an airpuff, as you'd find in cushion compacts, and find that this way, the coverage and finish seems to be even more beautiful and even than usual. MUA Luxe Palette in Enrapture £6 - You may have caught sight of these palettes on my Instagram as I've been going a bit snap happy with them - they have an incredibly beautiful aesthetic and are nigh on carbon copies of the Hourglass eye palettes. Fortunately, these are far less expensive, coming in at just £6 a pop! Enrapture, the darker and more purple of the two shade choices available, has some beautiful, muted shades that make for a great, soft-smokey eye - I especially like the dark shade in the corner, with it's pinkish shimmer suspended in the moody base. Grown Alchemist Hydra Mist £18 | My love for face mists have grown, and I love refreshing my face during the day, frankly whether it needs it or not now! This little number from Grown Alchemist is so handbag friendly, it beats taking some of my more bulky bottles, and the olive and sugar extracts make my skin feel revived - check out my full review of the Grown Alchemist range. Banila Co Honey Flower Essence Oil £25 | This is one of my favourite skincare items of the moment. You get the nourishment and moisturisation of an oil, but without the heavy, greasy feeling. Enriched with honey, it smells divine like nectar, and makes my skin feel smooth and plump. I even like to apply a little of this along my cheekbones on top of makeup as a bit of a highlight - it's beautiful. Charlotte Tilbury Dark Pearl £19 (here for US) | Can you tell I like cream shadow sticks? This one I think is a particularly beautiful shade. I love it as you can leave it intense and pigmented at the lashline and smudge the outer edges and it gives an effortlessly multi-dimensional look - it looks like you've gone in with multiple shadows, and expended a lot more effort than you really have. Charlotte Tilbury Amber Moon £29 (here for US) | Again, this is the perfect product to take your look from day to night. I just smudge a little (or a lot) of this chocolatey brown pencil into my lashline and smudge it a little to make it blown out and smokey. It's such a soft, easily workable pencil and the teeny speckles of golden-copper shimmery give some interest (A good alternative would be Pixi's Bronzebeam). Tom Ford Translucent Finishing Powder in Sable Voile £56 (here for US) | Although this is marketed as a translucent powder, it's far from - in fact it's quite pigmented. I take Sable Voile, much darker than my own skin, to use as contour/bronzer as the colour has such a nice tone. 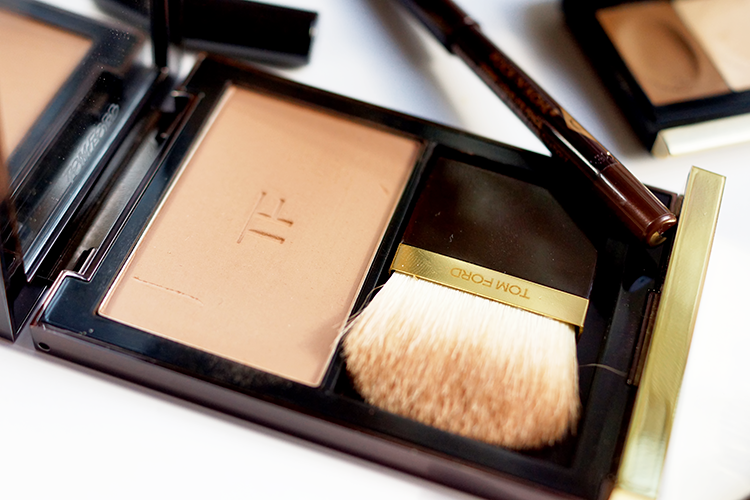 The brush included actually works well for contour/bronzing on the go too. Hourglass Ambient Lighting Powder in Dim Light £40 (here for US) | This is a no brainer to carry around as it's such a versatile powder for me. All over the crease to act as a transitional colour for the eye, through the backs of the cheek to add a teeny bit of warmth and shadow, it's such a forgiving powder that you can use freely and always end up with a good result. Nars Blush in Liberte £23 (here for US) | With all of the reddish tones around in makeup at the moment, I picked up Liberte, a burnished reddened shade that looks admittedly fairly intimidating in the pan. On the cheeks it's a different story - I use a big, fluffy, tapered brush (more often that not the Yachiyo brush) with just a tap of powder and it gives a beautiful flush. Smooth, blendable and buttery like the majority of Nars blushes, this is a great one to consider if you missed out on the Chanel Fall 2016 blush. Kevin Aucoin Sculpting Duo £22 (here for US) | Is there anything not to love with this palette? This remains to be my all time favourite contour compact (although the newly launched number featured in this post is really challenging top spot) - it's size is dinky and travel-friendly, the formula is smooth and blendable, the finish is beautiful and indiscernable as makeup, and the tone and intensity of colour is perfection. If you've written a WIMMB post, definitely link me in the comments below - I love reading them! 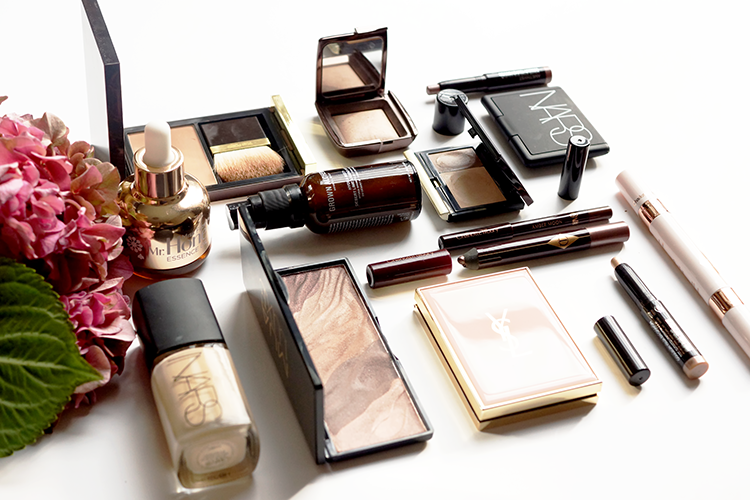 P.S Have you seen the YSL Couture Contour?? It's a stunner. 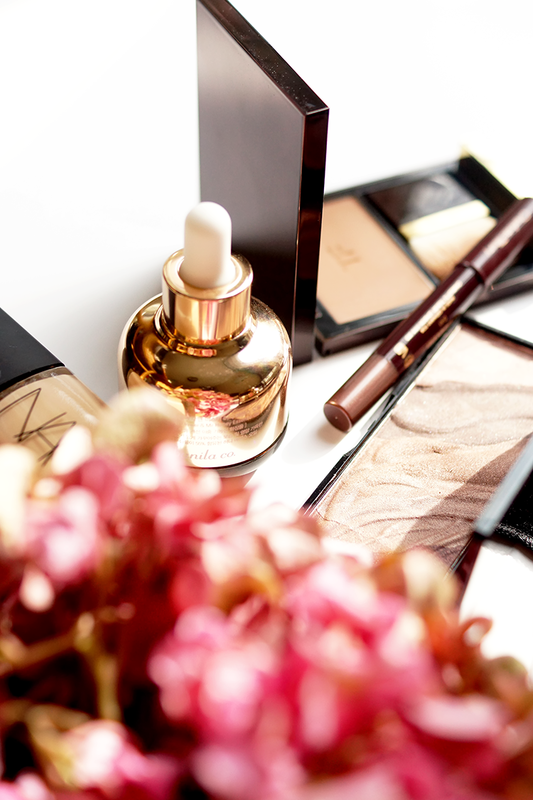 Such pretty images and lovely products. Cant believe that eyeshadow palette was only £6! It looks at home with all the high end products! What lovely pictures! 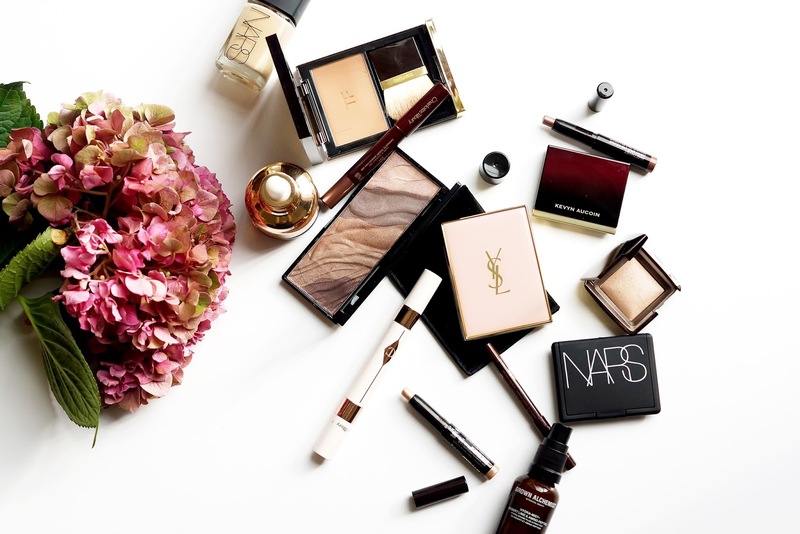 Thanks for sharing what's inside your makeup bag. I really enjoyed this post and especially your photos! that mua palette is amazing! 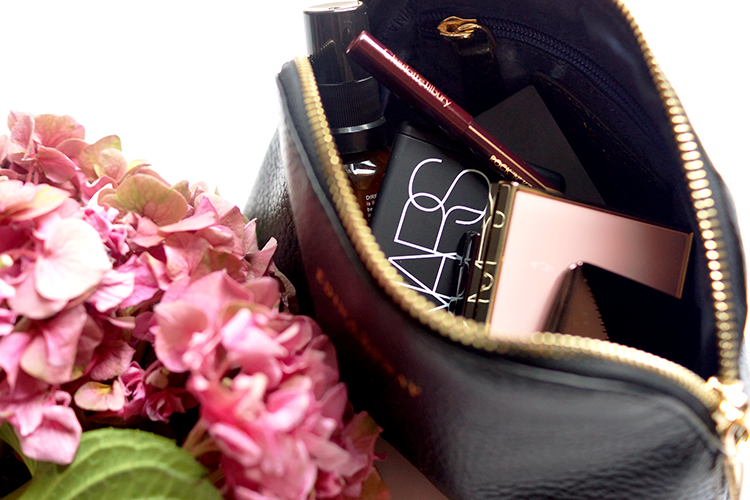 you've got lovely things in your makeup bag, I'm quite jealous! that MUA palette deceived me as hourglass'! so pretty! The MUA palette looks JUST LIKE the Hourglass palette! Never seen it before but I so tempted to give it a go now! Can't get enough of your photography! 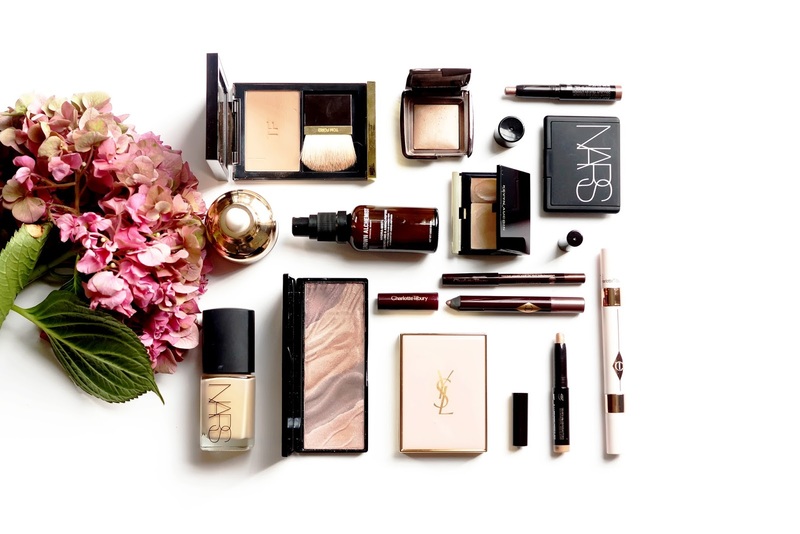 Gorgeous products! Your photography makes my head spins with excitement and these are my photography goals! On to the products, what a lovely selection and what a smart idea to use a darker powder as contour. It goes to show we can be very creative with the products and don't always have to use it as it is meant to be. I have a similar post coming up on Friday but still in the process of narrowing down my products. These images are out of this world! As usual, I'm so in love with your photos, Jennifer! You're an artist! I'm so glad I just stumbled upon your blog, I absolutely adore your photography! Loving your blog! You have amazing products . 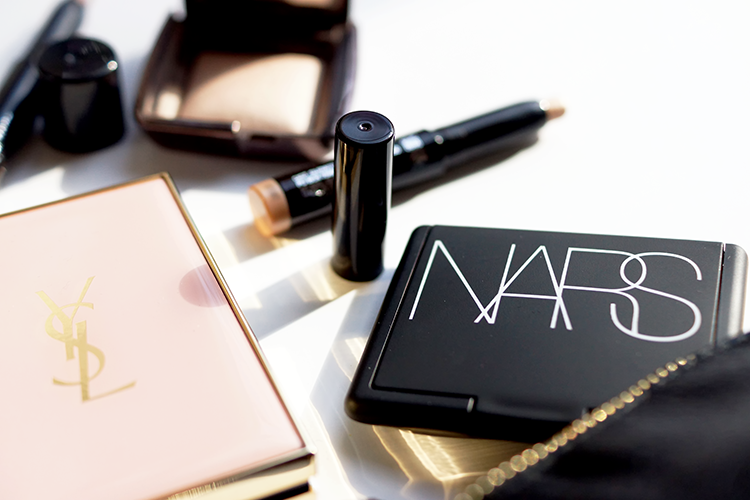 I want to try out this TF powder and also, Nars foundation. Holy crap girl... can you be even more perfect with your photos. Stop making the rest of us look bad! haha I am dying right now, I can and will never get mine to look as beautiful as yours! Wow! I love Charlotte's cream stick shadows too, one of my fave formulas! So beautiful! I really want to try the Hourglass powder.